Did climate change cause this massive wildfire in Greenland? - Unearthed Did climate change cause this massive wildfire in Greenland? Did climate change cause this massive wildfire in Greenland? A wildfire which blazed in Greenland earlier this summer was likely exacerbated by our changing climate. 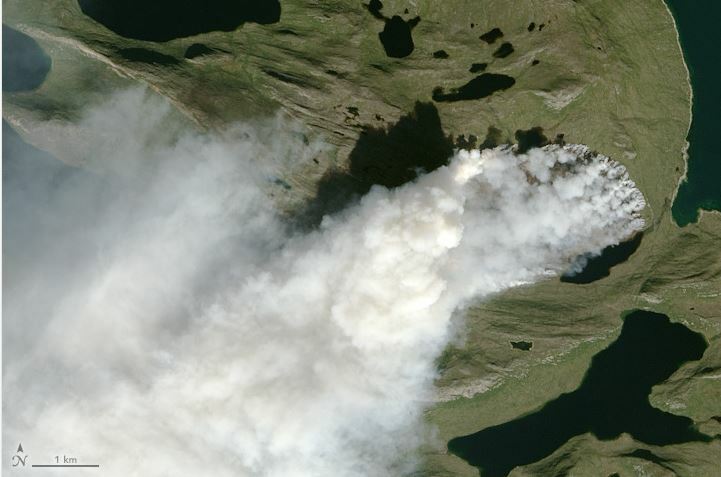 Satellite images show a fire in west Greenland burned for more than a week, with the first sighting on July 31st. Local media reports say smoke from the blaze, 90 miles northeast of the small town of Sisimuit, has risen two kilometres into the air and spread hundreds of miles across the surrounding area. The authorities in Greenland diverted traffic and canceled hiking and hunting trips near the fire. Covered in ice and featureless grassland, wildfires are rare in Greenland, but satellite images suggest that incidents have occurred in the region in recent years. Stef Lhermitte, of Delft University of Technology in the Netherlands, tweeted yesterday that the number of fires in the territory has shot up in 2017. Data collected by the Copernicus Atmosphere Monitoring Service (CAMS) shows a sharp up-tick in CO2 emissions in Greenland from forest fires in August. At the same time, forest fires in and around the Arctic circle have increased in recent times. A study published in 2013 found that the Boreal Forest, which stretches around the top of the world from Russia, through Scandinavia to Canada, was burning at an “unprecedented rate”. This summer, as the European press has been filled with stories about heatwaves and wildfires in the Mediterranean, fires in northern countries have also increased. Just last week, Climate Central reported that British Columbia in Canada was experiencing its second worst wildfire season of all time, with reports of smoke being seen as far away as Oregon in the United States. The increased incidents of fire in Canada is having a demonstrable impact on the Greenland icesheet. In June, scientists from the US traced vast amounts of soot from Canadian wildfires to the ice in Greenland, warning that the particles could accelerate the melting of the icesheet. Read more: Why does the melting Arctic sea ice matter? Recent research has suggested that climate change is accelerating the melting of the sheet, posing a risk to the whole planet through rising sea levels. The US government’s National Oceanic and Atmospheric Administration (NOAA) estimates that around 270 gigatons of water are lost per year because of melting. Marco Tedesco, a polar scientist at the Lamont-Doherty Earth Observatory at Columbia University, told Unearthed that the fires appear to be “exceptional in terms of the area covered” and said that more research was needed to examine how climate change was impacting the territory. “From a scientific point of view, we want to understand the sources of this fire. Was it an accident or a one-time event? Or was it part of a longer term trend that goes beyond the satellite data in 2000? What are the temperatures like? How many of these incidents have there been over the years?